With winter now here to stay for the next couple months, cold weather-related issues such as frozen pipes are back as well. However, most people are under the impression that simply keeping the home heated during the winter is enough to prevent issues like frozen pipes from happening, but this isn’t entirely true. There are numerous factors that can lead to your pipes freezing. For instance, if the pipes are placed in areas of your home that doesn’t have proper insulation, they could still freeze. Poor insulation around pipes is one of the top reasons that pipes freeze as the lack of appropriate material to keep heat in allows the frigid temperatures to sap warmth from pipes, allowing the water inside to freeze. 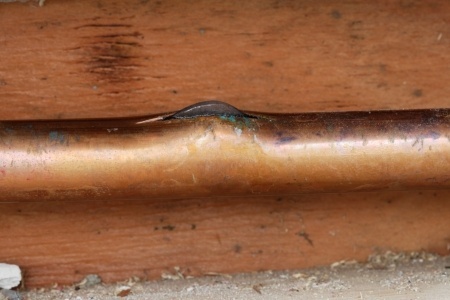 You could also find yourself with frozen water lines if your home isn’t sealed properly. If you have gaps leading outside that allow the outside cold air to creep in, it can quickly wreak havoc on your pipes during subzero temperatures, potentially causing them to potentially burst and leaving you with quite a mess. To prevent your pipes from freezing, there are a few precautionary steps you can take. To start, add insulation around piping – especially any lines that run along or near exterior walls. This plumbing is the most susceptible to cold conditions, and a professional home inspector can help you identify the pipes that are most at risk. You should also look for any locations in your home where you have cold draughts, says the City of Calgary, and look to identify – and eliminate – the source. You should also make sure that you are prepared just in case you do have a pipe freeze. The first thing you’ll need to do if the water freezes in your pipes is turn off the water for that pipe. This means you should make sure that you know where the shut-off valve for your water supply is and how it works (the main shut off should be well labeled in case somebody else needs to find it). That way if you are in the situation, you will be prepared to turn them off and stop any more damage from being done. Whether you’re looking to protect yourself from plumbing problems or are looking for a comprehensive assessment of a prospective home before you make an offer, Accurate Home Inspection offers comprehensive home inspections for homeowners and homebuyers in Calgary. To learn more about our services or to book an inspection, call us today at 403-826-6111 or request an inspection appointment online now.